For this month's "Maps Of The Month" featurette, I wish to draw your attention to Rick Bruns's Super Metroid (Super NES) maps. In what is widely considered the definitive Metroid game, Samus returns to Planet Zebes after Ridley has stolen the baby Metroid from Ceres. Old foes as well as new ones await Samus as they guard weapons, tools, and powers that she would try to reclaim and utilize to explore the planet and save the universe from Ridley, the Mother Brain, and the Space Pirates once again. Planet Zebes was previously visited in Metroid for the NES (or Metroid: Zero Mission for the GBA, if you prefer), but some of the planet was supposedly ravaged when the destruction of the first Mother Brain triggered a self-destruct. However, you can still see traces of the old Tourian and Brinstar here. Even if you didn't recognize that connection to a previous game, you would still appreciate Nintendo's attention to detail, like the extraordinary area design where the locations all fit together neatly, organically and with continuity, as if this were a living, breathing planet, helped along with some of the best graphics on the Super NES, or maybe any 2D game. Hyperbole? Maybe a little, but however you look at it, it's still a very well-designed game that remains incredible to this day. Super Metroid ranks high on many "best game of all time" lists, including placing #1 on such a list by EGM in 2003. The game design is clearly the inspiration for Castlevania: Symphony Of The Night on the PlayStation and Saturn, as well as the 2-D Castlevania games on the GBA and DS. If not for Super Metroid, we might not have those Castlevania games, or other so-called "Castleroid" or "Metroidvania" experiences. Here at VGMaps.com, we love these large-world, non-linear action-platformers in particular. There's a "wow" factor in being able to see how all the caves and tunnels and rooms fit together in an incredibly huge map, and such a map is also incredibly handy to find all of the items in the game. 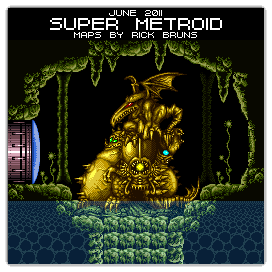 Though Super Metroid is one of the most-loved games of all time, it's quite a daunting task to dare reconstruct the entire planet into maps (one for each area, plus a huge one of the entire planet), but Rick Bruns stepped up to the challenge and managed to do it. It may not have taken under three hours, but it was worth it to get this "Mission Complete", and a Mapmaker Of The Month honour for Rick Bruns. So to recognize the effort put into this "100% completion" in scouring all of Planet Zebes, Rick Bruns's Super Metroid (Super NES) maps will be known as VGMaps.com's Maps Of The Month for June 2011. Re: 2011/06: ??? (Super NES) - ??? EDIT: OMG! The Maps of the Month is... wait, who is that? I was actually considering putting Super Metroid for the May 2012 Maps Of The Month...you know, I like to connect things thematically to the month whenever possible, and there's Mother Brain in this game, and Mother's Day in May. 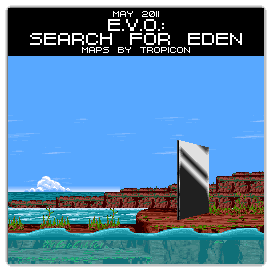 It just missed May 2011 by a tiny bit, as this game was fully mapped in very early May, and a full Zebes map more recently. Then I was also under the impression than next May would be its 18th birthday, however, I was thinking of its May 1994 appearance on the cover of Nintendo Power, but the game had actually come out April 1994. However, besides those reasons being kind of silly, ultimately I didn't want to wait a whole year for this, as the mapping of this game was already long overdue. So thanks again, Rick Bruns! Congrats! You certainly deserve the honor with those maps. Certainly no small feat! I am honored to have received the Map of the Month for this month. This was one of my favorite SNES games back in the day. It took me a little over a year to map the entire game (working on and off). It looks great being able to see the whole world all at once and was definitely worth all the effort I put into it. I will be making a 24' x 24' poster of it within the next few weeks. I will post here when it's done in case any of you need something to hang on the wall of the gaming room. A worthy winner of map of the month honors! This is by far the most beautiful game I've ever seen in 16-bit, and it's also my second favorite game of all time (second only to Zelda: Ocarina of Time). Say Rick, have you ever actually sold any of your maps? Somebody was harassing me about making a printed out Tales of Phantasia map years ago but I kind of ignored them. @Trop if you believe this (scroll at the bottom), then yes. Yes that list is of all the posters I have sold as of April 2011. I also sold some at the Too Many Games Convention this year as well as last. There was a court case a while back where a company making a strategy guide used a map from a game in the guide. Nintendo sued them and did not want them to use the map of their game in the guide. However the company making the guide won the case. It was determined that the map of the game was public domain and they had a right to use it in their guide. I guess it is like I can record a video of me playing a game and tell people where the secrets are and sell the video. However I do word it where I am giving the map away for free, and people are just paying for the printing, paper and shipping and all the extra is a donation towards making more maps. I also offer the images of my maps for free on my site as well as this site. Ah I see, and wow it's almost all Zelda. Heh, that's proof of a game's popularity if nothing else is. Speaking of Zelda, why has Nintendo hyped up Zelda's 25th anniversary so much this year, but not Metroid's? For the sounds of it, Metroid turned 25 this past weekend, and even I missed that! I could've put Super Metroid as Maps Of The Month this month (Golden Sun would've fit in June, as it is the start of summer). Did you see GameFAQs' poll yesterday? As far as popularity Zelda 3 had almost 10 times as many votes as Metroid 3. You gotta remember Nintendo is a giant corporation. Zelda makes more money, Zelda gets the fanfare that will make Nintendo more money. I don't deny that Zelda is more popular...and that Metroid doesn't do well in Japan...and that they're busy with pushing 3DS sales and finishing up development on the WiiU...but it's still kind of bizarre that Nintendo wouldn't say even a single thing about Metroid's 25th Anniversary, even a brief comment in passing. Not a thing! Fine, so I'm not an Iwata or Fils-Aime. Doesn't mean I can't still think their non-mention of Metroid silly. I'd be careful with the posters. Even if you can prove you aren't profiting from the sales, you're still affecting the image of the brand/intellectual property. And some companies are very protective of their branding and intellectual property. So just be careful. And yes, I can sue you for tarnishing the image of my branding. The damages being the potential loss in revenue. Isn't the civil court system great?